MASKerade: VV16 - How Much? Today is our 18th wedding anniversary. This is not the card I made for Michael (come back on Tuesday, for my CASology post), but one that came about while I was playing last week. I was looking at the Love You So set from Essentials by Ellen. I always thought that the arrow on this stamp did not extend far enough (sorry, Julie! lol!) to express how much a person might love another person, so a little simple masking allowed me to show an even bigger love. This idea seems so obvious to me now, that I'm convinced that I may have seen it somewhere, but I can't really remember - if it was you, please let me know so I can give you credit! I left it very simple, and I may include it in Struan's bag - he's leaving today for a 6 week Aircraft Maintenance course through the Air Cadet program. He's never been this far away for this long (although I admit to days of wishful thinking! lol!). Seriously, we're very proud of him and will miss him (especially on lawn mowing days!) and we wish him the best as he takes this next step in his 'flight path'! I'm linking up to Virginia's View 16 - 100% Stamped. There are some really clever cards in the gallery, make sure to check it out! Love, love, love this. Perfect for Struan. Wish him luck from us!! I love this card. It's beauty is in it's simplicity. Happy Anniversary Ardyth!!! Your card is so cute! I love it. Congratulations with your anniversary Ardyth! 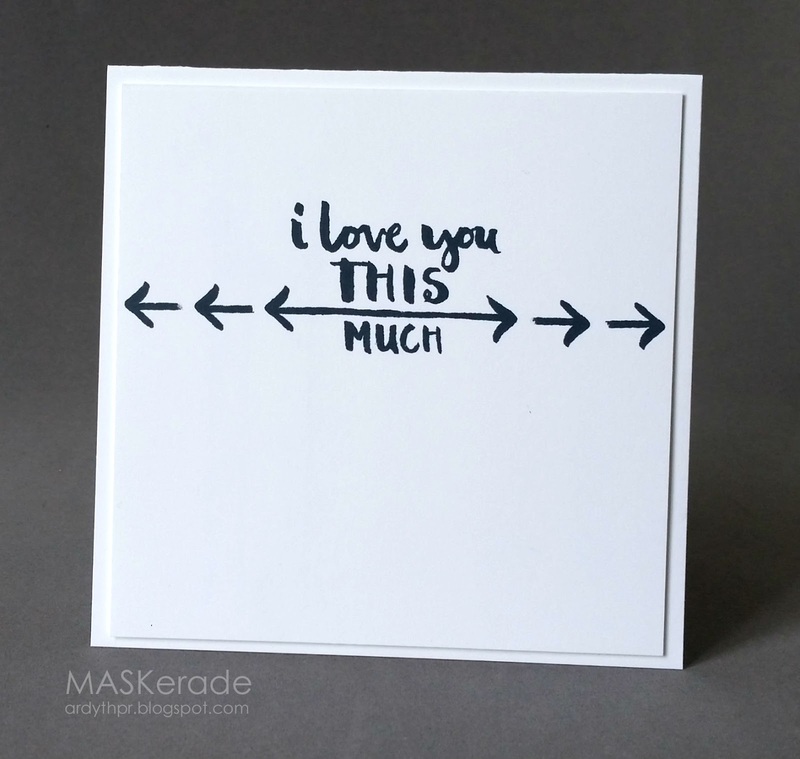 I think this card exactly shows what 'less is more' means and says all you need to say! Congratulations on your wedding anniversary Ardyth! Love this CAS OL card and I think it would be perfect for Struan to find while away from home. Good luck to him! Six week? My heart had a wee tug just reading your post! What an incredible adventure for an incredible young man! You must be sooooooo proud of him! Your card is awesome! It's amazing how dynamic black & white can be! This is super cute! I love those arrows stretched end to end! I bet your sweetie loved this! Looks like a big hug if those arrows were arms! Perfect...CAS that says it all.